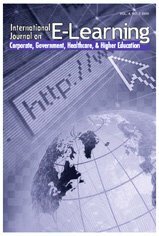 This paper explores the role of different types of support in corporate online learning programs. Most research has not specifically focused on all of the support factors required to provide a corporate online learning program although many research papers address several in regards to the research outcome. An effort was made in this paper to identify support factors in most corporate online learning programs and how those support variables are used. Further research should focus on identifying other support variables, integrating those variables into research that looks holistically at corporate online learning, and provides a template to identify the most important support factors for businesses looking to create an online learning program. Schultz, T. & Correia, A.P. (2015). Organizational Support in Online Learning Environments: Examination of Support Factors in Corporate Online Learning Implementation. International Journal on E-Learning, 14 (1), 83-95. Waynesville, NC USA: Association for the Advancement of Computing in Education (AACE). Retrieved April 24, 2019 from https://www.learntechlib.org/primary/p/39246/.